Six people have been arrested after a gang entered a sixth form college armed with knives and threatened students. 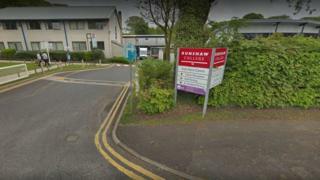 A 17-year-old boy was "nicked on the arm" at Runshaw College in Leyland, Lancashire, at 16:00 GMT. Police said the group of males, believed to be from Manchester, ran off when officers arrived. Three were arrested in a nearby car, one on foot and another after police stopped a car on the M55. The sixth arrest was made on Monday evening. Police said the injured student was treated in Chorley Hospital but his wound was not serious. Ch Insp Gary Crowe of Lancashire Police said: "We believe this was a targeted attack in that we think the group have gone to find someone and a separate student has received a minor injury. "This was not a random attack. "I would like to reassure people that the incident has now come to a close. The safety of the college's students and staff remains our priority and so we have stepped up patrols in the area and this will continue." Police said they got a tip-off at 10:40 from a member of staff that a group was coming to the college from Manchester "with weapons". Officers saw the gang come into the college grounds shortly before 16:00 armed with knives and threatening students. "When patrols arrived, the group made off from the college," the force said. "Three people who were inside a parked Nissan Micra close-by were arrested. A fourth person who made off on foot was also arrested." British Transport Police said on Twitter it would be using extra powers to stop and search people for weapons around Leyland railway station until 22:00.